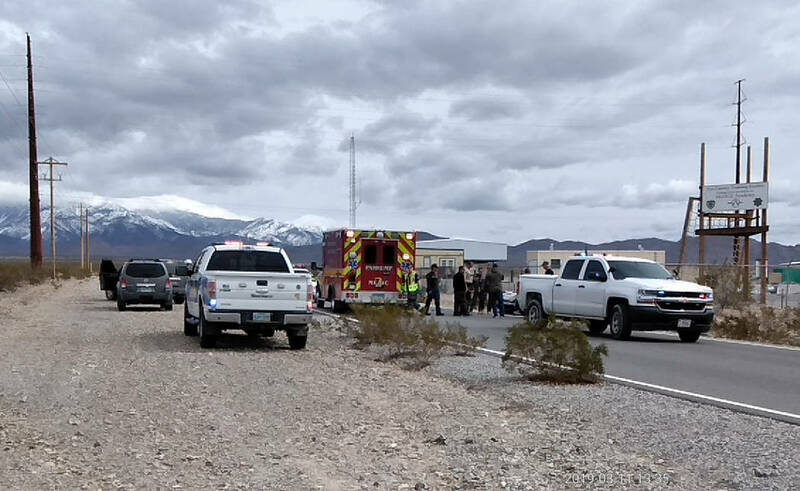 Selwyn Harris/Pahrump Valley Times Pahrump Valley Fire and Rescue crews transported two Nye County Sheriff's Office deputies following a crash as both were practicing maneuvers on their 1450 cc V-Twin Harley Davidson motorcycles. The incident occurred on Monday afternoon March 11, at the sheriff’s office training facility along Mesquite Avenue and Higley Road. According to a sheriff’s office news release, the incident occurred on Monday, March 11, just after 1 p.m. when the two deputies were practicing maneuvers prior to a training class at the sheriff’s office training facility on Mesquite Avenue and Higley Road. The Nye County Sheriff’s Office announced the return of motorcycle patrols throughout the Pahrump Valley back in June of 2015. Both deputies are expected to return to patrolling the valley byways and highways once they fully recover. The news release did not disclose the extent of their injuries.